Adopt healthy sleep habits early in pregnancy and your body will thank you later. Research shows too much or too little sleep during near the beginning of pregnancy can lead to hypertension and potentially serious complications during the third trimester. Women who sleep about nine hours night have significantly lower systolic and diastolic blood pressure compared to pregnant women with unhealthy sleep habits, researchers at the University of Washington report. Abnormal sleep duration is also associated with preeclampsia, a condition linked to pregnancy induced hypertension and excess protein in urine. Preeclampsia can lead to serious or fatal complications if left untreated. About 1 in 5 women said they slept nine hours per night - the normal sleep duration for pregnant women. More than half the women slept seven to eight hours per night. About 14 percent of women slept less than six hours, and around 10 percent of women slept 10 hours or more. Short sleepers and long sleepers had an average systolic blood pressure of 118.05 mm Hg and 118.90 mm Hg, respectively. Healthy sleeping pregnant women had much lower average blood pressure, at 114 mm Hg. The National Heart, Lung, and Blood Institute reports a systolic blood pressure reading of 140 mm Hg or more is considered high. Short sleepers also had a 10 times higher preeclampsia rate. Overall, about 6.3 percent of study participants were diagnosed with preeclampsia or pregnancy induced-hypertension. 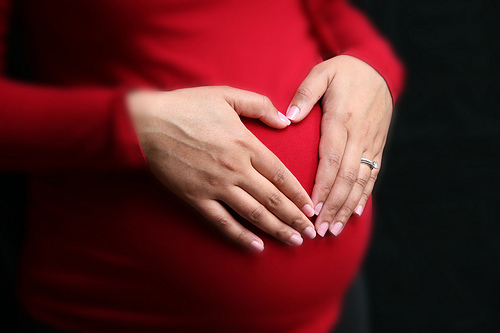 Sleep patterns tend to change throughout pregnancy due to shifting hormone levels. Pregnant women tend to sleep longer than normal adults. Read more about Sleep & Pregnancy at Sleepeducation.com.